When I was a senior in high school I worked in cheesecake shop. I ate so much cheesecake you would think I would be sick of it, even to this day, but I am not. I love cheesecake. I am sure my boss thought we would grow tired of all the free cheesecake, but he gravely underestimated me. And back when I was 17 my metabolism was quicker than my mouth. I managed to eat cheesecake my entire shift and still lose weight. Now I gain a pound just thinking about dreamy creamy cheesecake, why does God torture us like so? Nowadays cheesecake is so rarely in my diet. I may have one slice a year if I am lucky. Actually, sweets aren’t my thing as I grow older (and maybe even wiser?). I would prefer a salty bag of potato chips over most sweets – except chocolate chip cookies and CHEESECAKE. Listen, everyone is powerless over something. 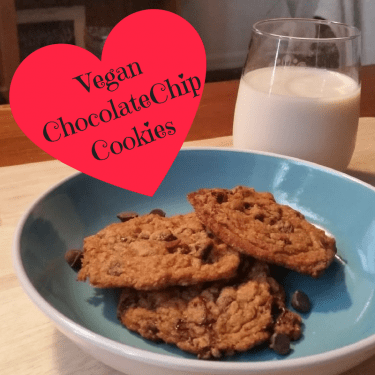 As my eating habits have changed, I have begun to really experiment with converting a lot of my favorite recipes into Vegan versions, and sometimes even raw versions. 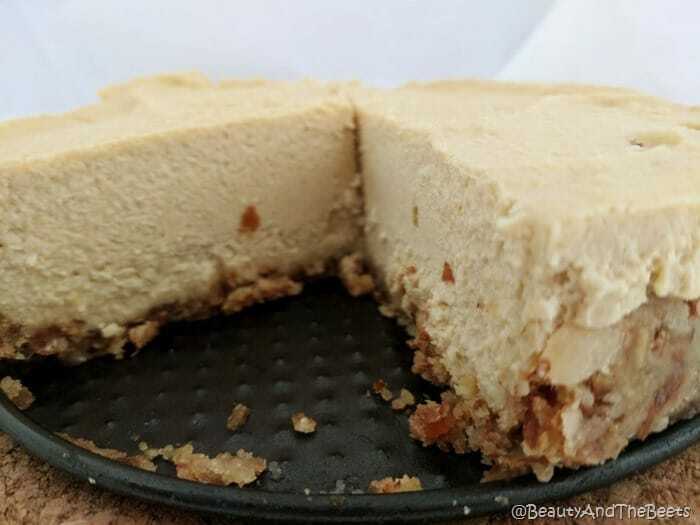 So after a lot of research and experimenting, I have finally discovered how to make a raw and Vegan cheesecake. Ring the bells. Sound the alarm. 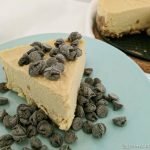 Vegan cheesecake can be a thing. 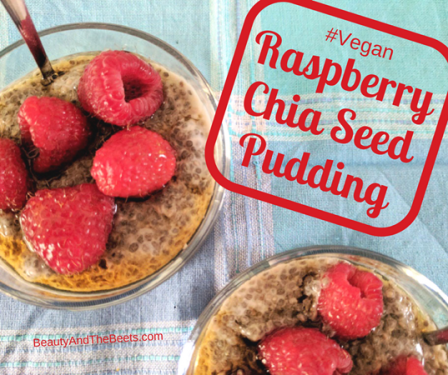 Of course, very rarely can you make one of your favorite foods Vegan and have it taste the same. (The exception to that is hot dogs- Kellogg’s makes the most amazing Vegan hot dogs that taste just like the real thing, but that’s for another day). So I can’t sugarcoat it- Vegan cheesecake does not taste like its dairy counterpart. However, the Vegan version still tastes quite tasty, and the varieties can be endless. As with any dairy cheesecake, you can fruit to make your cake strawberry or mango flavored. You can add chocolate, or any variety of extracts like maple or vanilla. 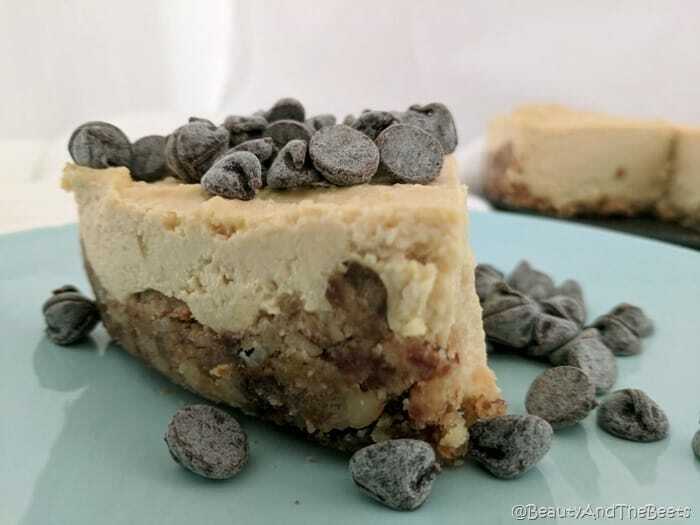 I made my Vegan cheesecake vanilla then topped it with frozen Vegan chocolate chips. I have no regrets. Grease a *7-inch SpringForm pan* with cooking spray. Press the crumbly mixture into the greased SpringForm pan to form the crust. To a blender or food processor, add the cashews, melted coconut oil, maple syrup, non-dairy milk, vanilla extract, and Stevia drops. Spread the filling on top of the crust in the SpringForm pan. 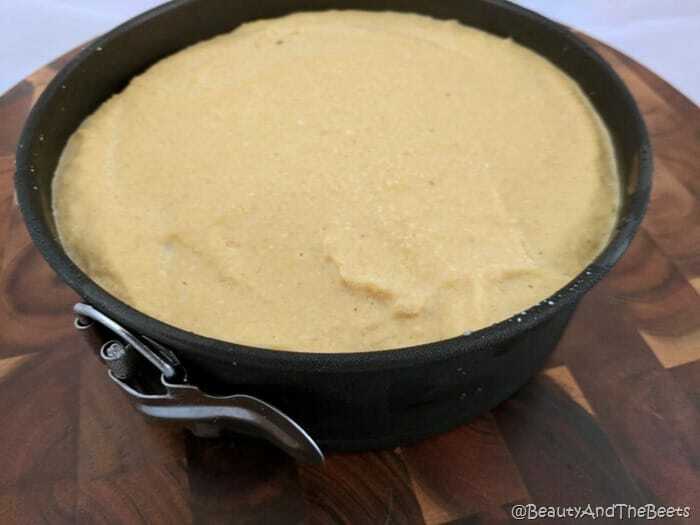 Freeze the cake for 8-12 hours or overnight. Thaw 1-2 hours before serving, removing the SpringForm pan while the cake is still frozen. 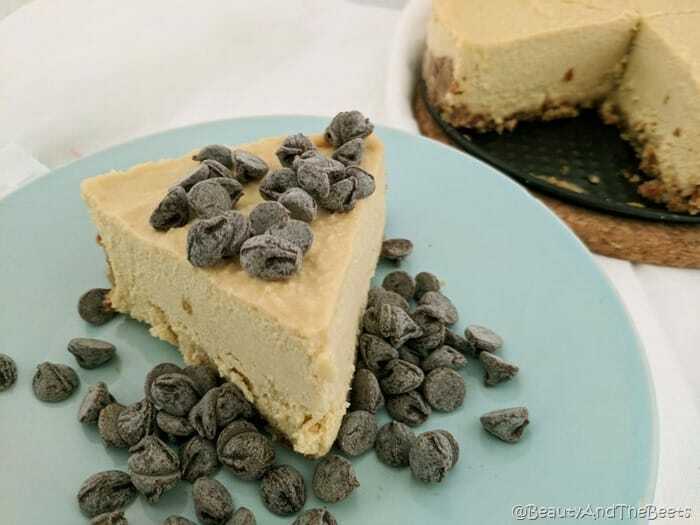 Top the cheesecake with frozen non-dairy chocolate chips, or pureed fruit before serving, if desired. *Hands on time is 10 minutes but you will need to soak the cashews for 3 hours prior to making the cheesecake, and 8-12 hours to freeze. *There are affiliate links in this post which are of no additional cost to you if you purchase any of the items. I only link to products I trust and use myself. As always, thank you for your support. There is NO WAY this recipe can fail and not be absolutely delicious. It will definitely be my mission to make this over the holidays – Thank you!!!!!!!!! !